HtN: You can see that, on screen. For me, it’s a joyful experience, watching everyone tell their tale. But I imagine it was cathartic. Peter Bratt: And I do think that every single human being is part of a family. 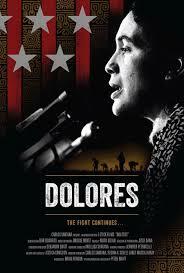 And every family has things that they work through, and I think that’s what makes Dolores and her story so relatable to audiences, who see themselves in her. There are plenty of single and working mothers – and fathers – who find themselves in the same predicament: both parents are working, and they have to leave their children in childcare all day, and there’s a struggle there. I see people relating to her struggle. 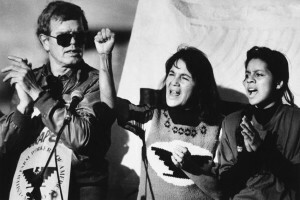 Dolores C. Huerta: And it’s very expensive! I mean, for my daughter Camilla, who is the weepy one in the film, her monthly day care is more expensive than her mortgage. And we also don’t want mothers to feel that they can bring their children to marches or movements. But one of the first things we see in the film is my 8-year-old son Emilio, who is now a civil-rights attorney – and a congressional candidate, by the way, for the 21st Congressional District in California – and you see him marching with me, and he was on the march to Sacramento as a little boy. And I think that’s why my children believe so strongly in these ideas today, because they were able to be part of the movement. And I actually wasn’t that supportive of Peter when he was working on the film because I was busy working on the Hillary campaign, and all over the country. DH: (laughs) I wasn’t able to give him much direction. And then, of course, as Peter said, I wanted the film to focus on the work my foundation is doing. And now, we just won a big settlement against Kern County High School District, in California, for the suspension and expulsion of African-American students. You know, African-Americans were being suspended and expelled at rates 500 times higher than that of white kids, and Latinos as rates 400 times higher. But, you know, the main thing about the film is that the work we were doing back then is still relevant to today, and nobody could have predicted that. All the things that we went through, in the farm workers’ movement, back when people were getting killed, just to try and get toilets in the fields, and rest periods and the right to organize, and we were up against the biggest powers at that time – even the President of the United States, Richard Nixon, as well as Ronald Reagan, then the Governor of California – and even the Teamsters Union at that time, and the poorest of the poor were able to overcome all of these obstacles with the help of the American public, which supported the grape boycott. And we won! And we also talk about, in the film, the need for ethnic studies, so people know their own history, which I think is so important. I really believe that if people knew – if every single child, in their school books, was taught – that the Native Americans were the first slaves in the United States, and that African slaves built the White House and the Capitol, and that it was people from Mexico and the Philippines and China and Japan that built the railroads and toiled in the fields, you wouldn’t have all this racism. And the same with the contributions of women and the labor movement and our LGBT community … you wouldn’t have the homophobia and the misogyny that we’re facing now. So, hopefully this film will inspire people to think and act. You know, we’ve got to get ethnic studies at the kindergarten level. And we see just the opposite happening. In Arizona, they tried to do away with ethnic studies and we see the same thing happening Texas and some of these other states. So instead of informing people, they are creating more ignorance and more hatred. HtN: Indeed, sad to say. Plus ça change, plus c’est la même chose. We think we’ve won battle, and then it turns we’re re-fighting the same ones. So, I have just one final question. Though you are not on screen at the same time, there’s a really interesting back-and-forth dialogue between you and Gloria Steinem, talking about your respective brands of feminism. I am seeing a lot of films right now about the ever-increasing restrictions of abortion rights at the state level. You talk about your own struggle reconciling your Catholicism with pro-choice views. What advice would you give choice activists today, as we watch ever-more-onerous laws passed to restrict access to abortion? DH: By the way, I’m on the board of the Feminist Majority Foundation, and I think that we have to do what the gay movement did. The gay movement actually went out and came out of the closet so that their families would have to realize that they had gay members in their own family. And I think we have to do the same thing with the abortion issue. I’m the mother of 11 children. How many people have 11 kids, you know? They’re using birth control and having abortions. So I think we have to start coming out and saying, “I had an abortion.” You know what I mean? This is a medical procedure, and it’s a right that women have, and families have, to determine the size of their own families. And that should not be taken away from them. But also, before we end the interview, I also want to say that the other thing in the movie that is very powerful is when Robert Kennedy, in his last public words – just before he gets killed – says that we have obligations and responsibilities to our fellow citizens. And this is what we have to do, because we can have 40,000 people marching in Boston, but we have to vote. People have to get engaged, they have to vote, not only at the national level, but at the local level. We have to stop all of these voter-suppression laws. And one last thing, we have to change the fact that people don’t know about labor unions. Thanks to them, we have the 8-hour work day, weekends, safety standards, social security, workers’ compensation, all of these things that labor fought for, but people have no clue, because it’s not taught in our schools.